Daytona Motorsport′s TW STeel Dmax Championship roared off the grid on Sunday (15th Feb) with 130 drivers taking part in the opening round. With both Endurance and Heats Championships – and separate races for Light, Inter and Heavy Weight Classes, the series offers drivers everything they need in a motor racing championship. 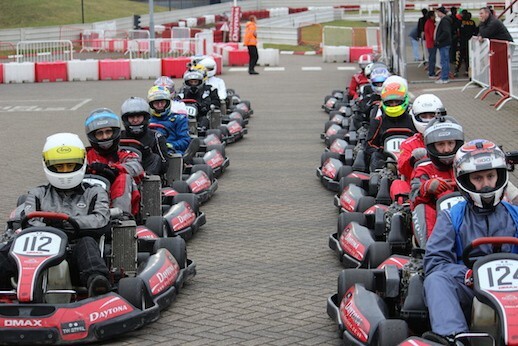 Daytona provide karts, racewear, marshals, race officials, laptiming and some very close racing. With a brand new fleet of Birel race chassis and the brand new Rotax Max Evo engines arriving for round two, Daytona were keen to deliver great racing and evenly matched karts for the first round – and they delivered. The Inter Enduro Qualifying saw the top 7 drivers split by just 0.133 seconds and the race finished with just 0.082 seconds between first and second after an hours racing. Heavy Heats: Tomek Zaustowicz, Chris Carter and Dave Vincent.